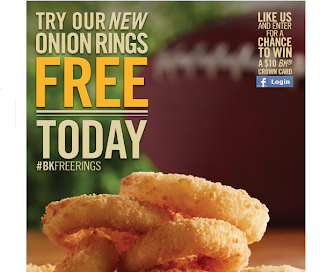 Come to BURGER KING® all weekend long, Feb 4-5 only, to celebrate the big day with free new onion rings. No purchase necessary. THE FINE PRINT: WHILE SUPPLIES LAST. ONE VALUE SIZED ONION RINGS PER PERSON PER VISIT. AT PARTICIPATING RESTAURANTS. NOT VALID DURING BREAKFAST HOURS.